My boys have always loved the Christmas stop motion classics. 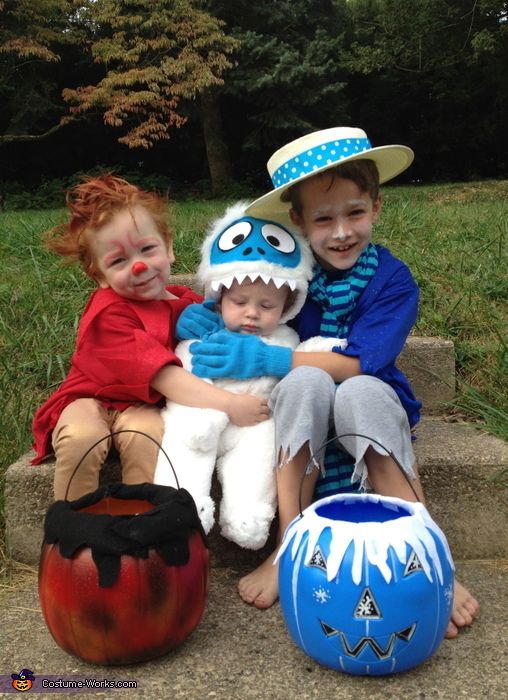 They particularly loved the Miser brothers, and with having a red head he just happened to make the best heat miser. So we went with this stop motion classic theme. For the Miser brothers I took some old tshirts and added some sparkle fabric and cut felt to add around the bottom and cuffs of the sleeves. For the snow miser it was a matter of finding the right material for the scarf and transforming an old white straw hat and molding it, then hot gluing it in the shape of a skimmer hat. For the baby Bumbles snow monster, I acquired a white infant snow suit and just attached some felt and fuzzy white fur fabric I had sewn together into the face of the bumbles.